A hugely popular hobby now is cardmaking and building scrapbooks. A new bespoke shop has open in Movilla Street in Newtownards catering for all sorts of craft enthusiasts and providing master classes in Card Making and Scrapbooking. 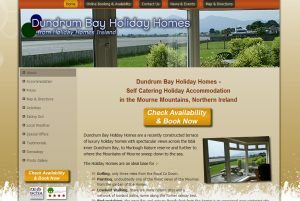 Dundrum Bay holiday homes is a range of beautiful a well equiped self catering holiday accommodation in Dundrum, Northern IrelandThe website boasts a huge range of interactive features including flash animations, dynamic photograph galleries, and an online availability booking and payment engine. The website can be updated by the client using our content management system. 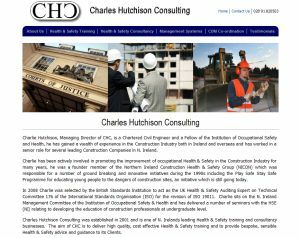 Charles Hutchison Consulting provide training and consultancy in health and safety to the construction industry. They provide a variety of health and safety courses throughout the country.This website allows the up and coming courses to be displayed for potential customers, it also provides information on the types of consultancy projects that the company undertakes. An online booking facility allows customers to book courses online quickly and easily. 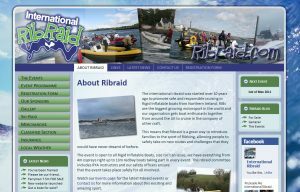 The Ribraid has been running for over 10 years now and promotes safe and responsible RIB boat ownership with a range of organised family cruises throughout the year.We’ve given the website a completely new look for this years events and improved the functionality, making it alot more dynamic and interactive with galleries, mailing lists, social media integration, blogs and calendars, all updated using content management. 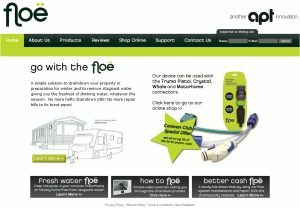 The floe is an innovative new product which can be used to quickly and effectively drain water from a caravan or motorhome plumbing system before the van is stored for winter.The site includes a huge along of features including embedded video clips of how the system works and a mailing list sign up box as well as an online shop to buy the product.